Prior to 1928, the police force consisted of one or sometimes two men, appointed by the Village Board, to serve more or less as watchmen. The two-man Department served the village until 1941 when the construction of the Seneca Army Depot and Sampson Naval Base caused an influx of people into the area and a third man was appointed. By now the working hours were down to fifty-six hours per week. Also, in 1941, the Department received its first patrol car. This vehicle was used until 1949. In 1993 due to the increased demand for services and increased criminal activity, an additional officer was added, bringing the Police Department to a total of 3 Sergeants, 4 Patrolmen, a Chief, one Clerk, and 2 part-time Officers. The Department continues to develop new programs and obtain added resources. 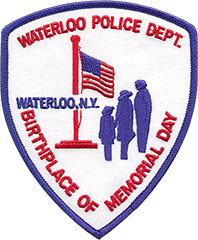 Today the Department provides 24-hour coverage to the residents of the Village of Waterloo, with highly skilled, trained, and well-equipped officers.